Editors’ Note: There are three maps associated with this press release. 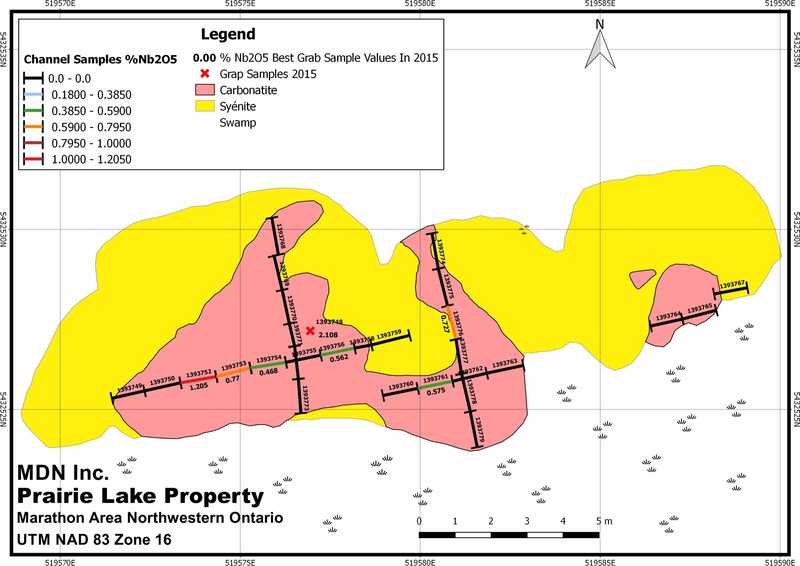 MDN Inc. (TSX:MDN) (the “Company”) is pleased to announce that its exploration team has discovered a new carbonatite occurrence hosting high grade niobium oxide (Nb2O5) values in grab and channel samples, on the Prairie Lake Property in the Marathon area, Ontario, Canada. 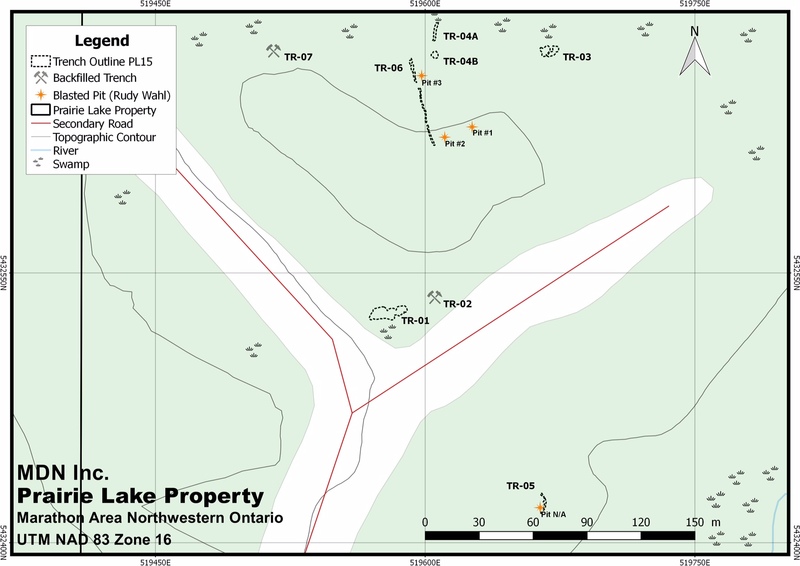 The discovery is located in trench TR-01, some 100 meters south-west of the high-grade showings of blasted pits 1 and 2 (see June 25, 2015 press release and figure 1 below). On the new discovery three continuous channel samples on the carbonatite gave 1.21% Nb2O5 over 1.1 meter, 0.77% Nb2O5 over 1.0 meter and 0.47% Nb2O5 over 1.2 meter for a weighted average of 0.81% Nb2O5 over 3.3 meters (figure 2). On the same stripped area, three other non-adjacent one-meter channel samples gave 0.73, 0.58 and 0.56% Nb2O5. The selected grab sample that led to this discovery assayed 2.11% Nb2O5. The attitude and thickness of this carbonatite is unknown and more work is required to determine the source of the occurrence. Preliminary geological observations suggest vaguely defined shallow dipping magmatic bedding in the carbonatite which is sitting under the syenite. The discovery was made during the summer field work program consisting of prospecting (102 grab samples), mechanical stripping (8 areas), washing, geological mapping and channel sampling (64 samples). This campaign also revealed another potential carbonatite intrusive north of trench TR-04A, just 50 meters north of pits 1 and 2 and 150 meters north-east of TR-01 (figure 1 and 3 below). The stripped area shows a contact between an ijolite and a syenite with a window of carbonatite under the syenite; the carbonatite apparently extending under the swamp to the north. 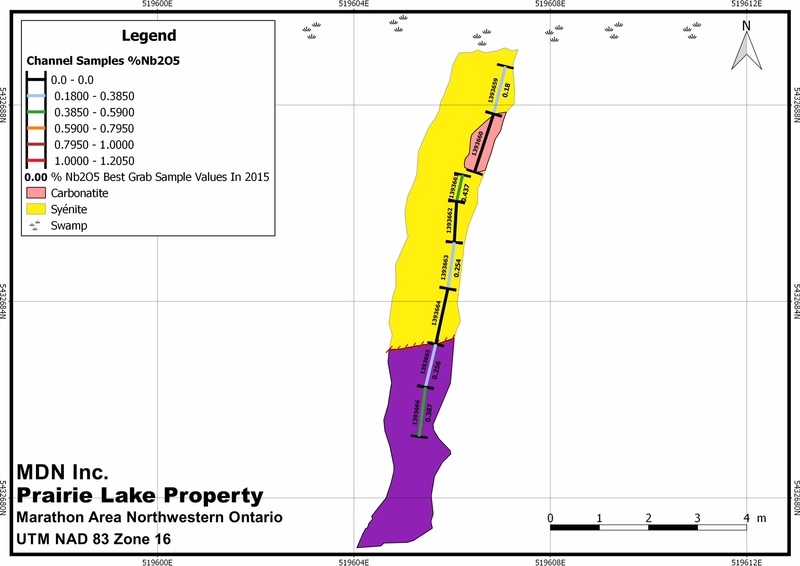 At the contact, the ijolite is grading 0.32% Nb2O5 over 2.0 meters while the syenite got three non-adjacent channel samples of 0.44%, 0.25% and 0.18% Nb2O5over respectively 0.6, 1.0 and 1.0 meter. Again here, the lithological contact seems to be sub-horizontal. This summer exploration works also demonstrated that the previous niobium showings found in the blasted pits were made of narrow carbonatite dykes and/or syenite breccia with carbonatite matrix within barren syenite. “We are delighted with these high grade results coming from the trench #1. Our focus will move to better understand the source of the high grade niobium and thus drilling in due time. Current market conditions are very challenging, and we want to ensure to create as much value to our shareholders in those difficult times,” commented Mr. Claude Dufresne, President and CEO of MDN. All samples were sent at Activation Laboratory (Actlabs), in Thunder Bay, an ISO 17025 accredited laboratory. First pass assaying was with ActLabs’s ICP lithogeochemistry package 4B2-std and all samples giving more than 1,000 ppm niobium were re-assayed by XRF on fused borate beads to give precise quantitative Nb2O5 results. The Prairie Lake property is located about 45 kilometers northwest of the city of Marathon, Ontario, Canada. Earlier this year, MDN signed two option agreements to acquire 100% of the Prairie Lake and Prairie Lake South properties (see February 24, 2015 press release). Jacquelin Gauthier, P. Geo., P. Eng., acted as the qualified person as defined in National Instrument 43-101. He planned and supervised the summer field program and he reviewed and approved the technical and scientific content of this press release.